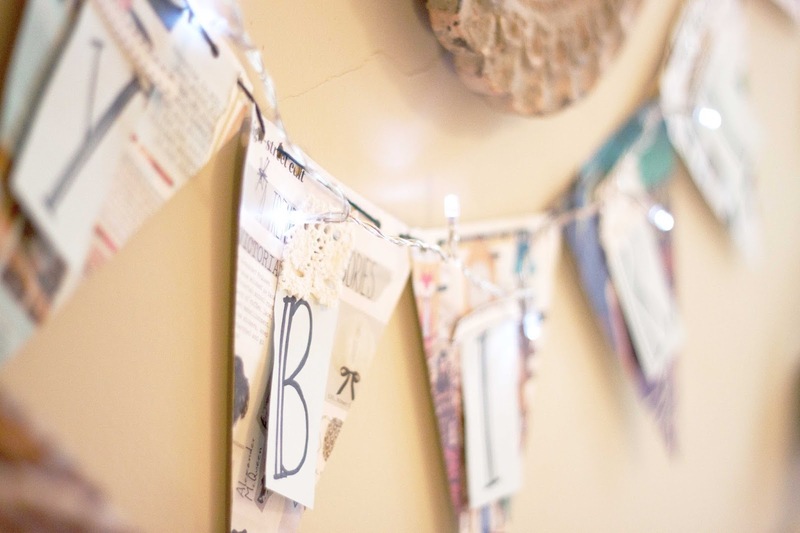 Aside from all the good food, decoration and ambiance makes a venue – be it the local pub or your home – feel like a party, and bunting is a great way of dressing up the place without tonnes of effort. However, if you don’t fancy pre-made bunting and want a more personal touch, then homemade bunting is the way to go. Whether you want to go all out and sew fabric triangles with trim and embellishment, or use fancy card and calligraphy for a special occasion, there’s so much style and choice you can go for. On this occasion, I put my old COMPANY magazines to good use and focused on bright, summery shades to bring some warmth to the house – plus we’re lusting over those summer holidays right about now aren’t we? – and to also reflect our cottage’s trinket and arty homemade feel. This took maybe 2 hours from conception to making and hanging (it was also done as a surprise so I had to be stealthy), but it’s simple and easy to craft and looks so cute when it’s finished. 1. Select the pages to suit your theme, and stick them to the card for sturdy support. On the back, rule a line halfway down the page, and half again to find the point for each triangle. 2. Measure a 2cm gap at the top of each triangle for the holes, and then draw a triangle from the bottom of the 2cm gap to the mid-point at the bottom of the page. 3. Cut out the shapes and arrange in a colour order for effect (You can also use your off-cuttings as a separate bunting decoration if you like!). Hole punch the tops of the triangle for the thread to go through and link the bunting. 4. Measure the narrowest width of your triangle and the maximum height to make a square to write your ‘Happy Birthday’ on, and experiment with fonts. 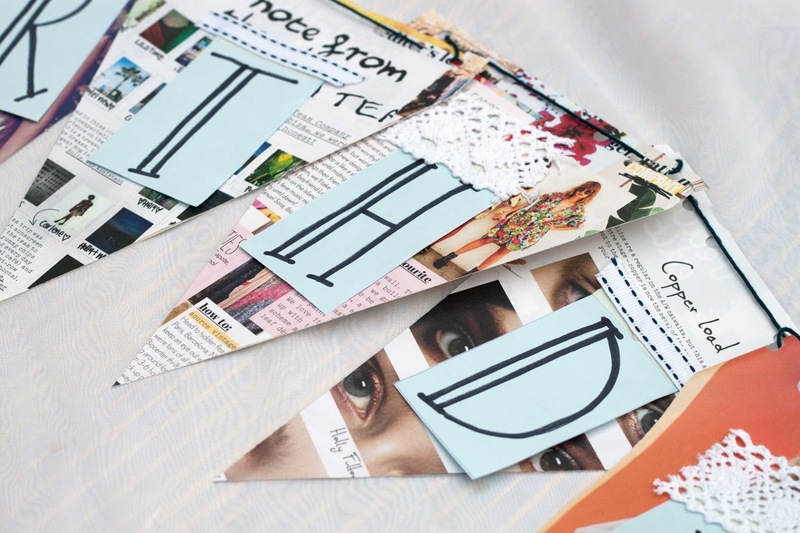 To attach, apply a thin line of masking tape on the letters to attach to each triangle, and then cut alternative pieces of adhesive lace and ribbon to cover the tape and secure the letters whilst hung up. 5. Take a piece of thick coloured thread and link up all the bunting, securing the ends when finished. All that’s left to do now is to hang you bunting in a clear space, surround with some fairy lights for added effect and let the party get started! 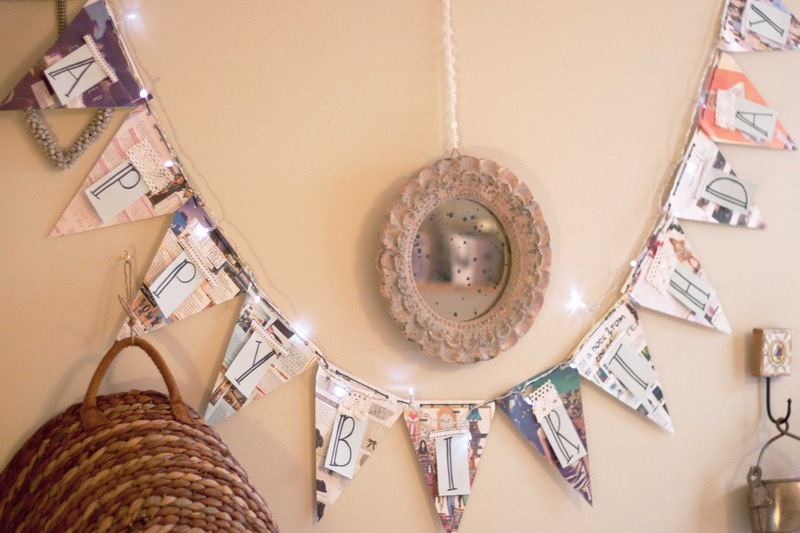 I love the rustic effect the bunting has – especially from using COMPANY magazine which has a lovely scrapbook effect – and it can be used all year long, perfect for your mum, housemate, sister and their dog’s birthdays this year until December. There’s so many combinations you can do to create the perfect theme for your party, and the homemade touch really gives it a nice edge and specialty that you don’t get with the thin foil stuff these days – quick, yes, long lasting, no. 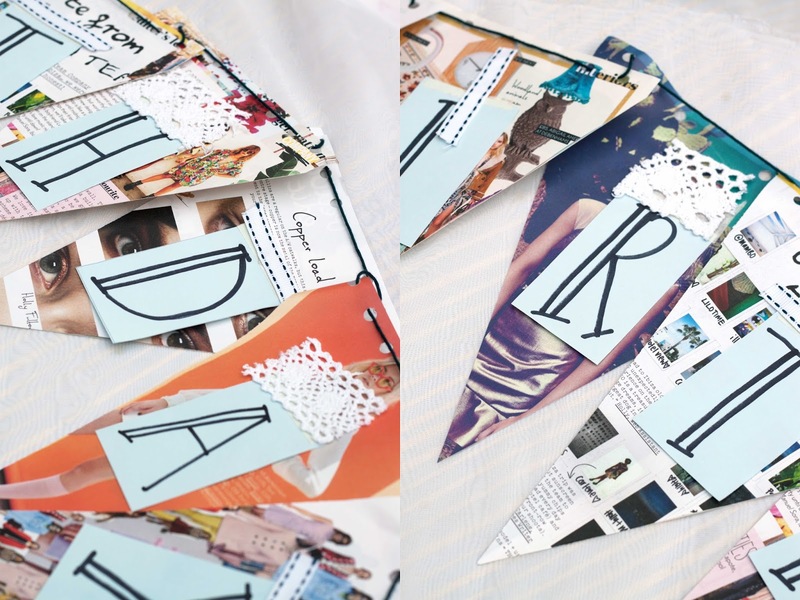 So if you’re looking to jazz up your bedroom, or make a special momento for a special someone’s day, homemade bunting is a lovely way to make their day feel amazing and celebratory – now bring on the cakes! 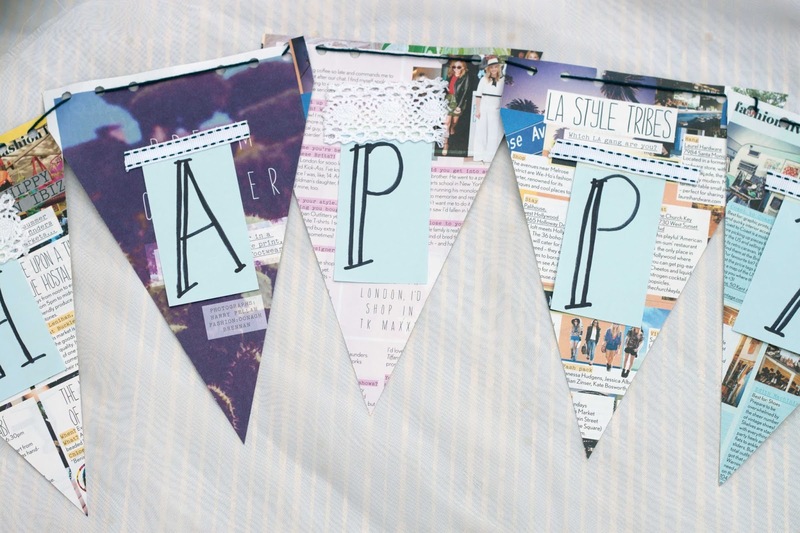 Have you made bunting before? 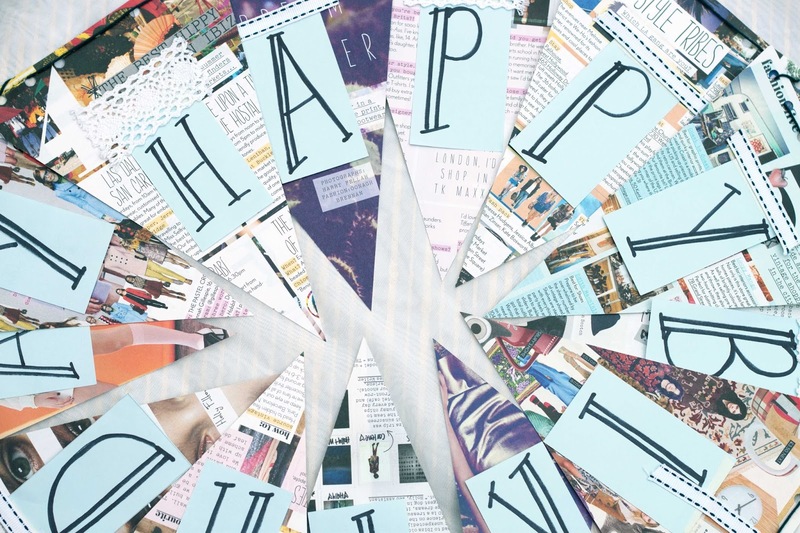 Are you a fan of loads of birthday decocrations? What cake to you have at parties? Previous Post SO YOU WANT TO EAT HEALTHIER….